This two bedroom townhouse features a fully equipped kitchen, living room with wood fireplace, optional daily housekeeping*, washer & dryer and private ski storage just outside of the unit. This multi-level unit features a king size bed in each of the two bedrooms, as well as two bathrooms. A Queen-size pull-out couch in the living room also offers additional bedding for guests. Private free parking and Wi-Fi are included with your stay. A departure cleaning fee is added to each reservation. A mid- stay cleaning fee will be added to all reservations 5 nights or more. Daily housekeeping is available a la carte with 48 hours notice. 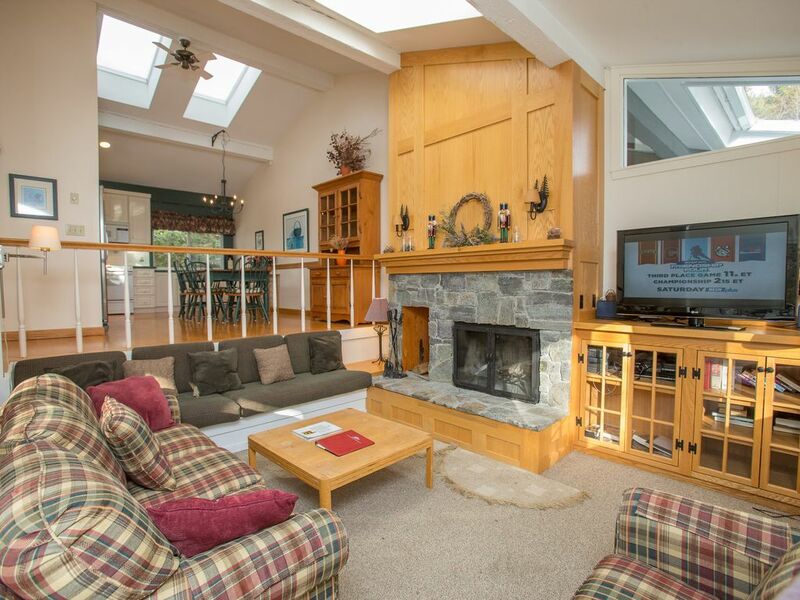 Stowe Vacation Rentals offers a variety of lodging options in beautiful Stowe Vermont. Trusted by over one hundred homeowners, we offer rentals directly on the slopes of Stowe Mountain Resort, ski in ski out rentals at Stowe Mountain Lodge and The Spruce Peak Adventure Center, and along the Mountain Rd. Supported by 24 hour service we strive to make your stay as memorable as possible. We look forward to welcoming you to the beautiful mountain village of Stowe Vermont. This unit is located within walking distance to Stowe Mountain Resort’s Toll House Chairlift (weather dependent, winter seasonal). In the summer and fall months, enjoy Stowe Mountain Resort's attractions, including the the Auto Toll Road (seasonal), and summer adventures, such as ZipLine, TreeTop Adventure, and Stowe Rocks indoor climbing center. * Please go to to learn more about these activities! Additionally, this condominium is minutes from the village of Stowe, restaurants, dining and Vermont favorite past times! *Some adventures/amenities are seasonal/weather dependent, and may require additional fees. This unit is located within walking distance to Stowe Mountain Resort's Auto Toll Road (Seasonal) and the Toll House Chairlift (weather dependent). This unit is located within walking distance to the Toll House Chairlift (weather dependent). Overall the property is nice and furnished very well. It was definitely great for two couples traveling together, as we each got our own spaces. The shared area was also very nice with nice furniture and a newly renovated kitchen. The only issue I had was that there were many spiders everywhere! As a person who isn’t fond of spiders, I didn’t get much sleep. This is unfortunate, as it’s a problem that is easily remedied by ensuring the property is routinely treated for such things. Housekeeping Fees: A Departure Cleaning Fee is added to every reservation. A Mid-Stay Cleaning Fee of $105 is added to reservations of 5 nights or more. Optional daily housekeeping is available a la carte; please inquire upon making the reservation.